It could be justifiably argued that this spacious penthouse apartment enjoys one of the most outstanding views in the Lake District. 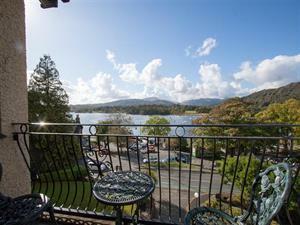 Located on the top floor of one of the most prestigious developments within the Lakes, the views encapsulate the magnificence of the National Park, with Lake Windermere in the foreground, and only three minutes walk. Black Fell, Coniston Old Man and Weatherlam, together with Crinkle Crags and Loughrigg Fell all clearly visible. The views are uninterrupted and the sunsets stunning. Waterhead itself boasts two delightful restaurant/bars overlooking the lake, together with a few shops and the steamer piers from which the lake cruises come and go to take you the length and breadth of beautiful Lake Windermere. A short stroll to Ambleside village will bring you to a fine choice of tempting restaurants, pubs and local shops. Walks straight from the door include Jenkins Crag, Todd Crag and Loughrigg Fell. A regular and frequent bus service passes the development, providing access to all of the Lakes towns and villages. The car could stay parked for the duration of your break. The penthouse is set within two acres of beautifully landscaped gardens with meandering paths leading to strategically placed vantage points with seating, all enjoying far reaching views of the lake and fells. There is an elevated barbecue area. Romney Grange can be reached by stairs or lift, making it an ideal holiday home for young or old. No expense has been spared within the interior's design or upkeep. The presentation is simply meticulous, you will appreciate the high quality interior. Having its own housekeeper is a bonus to the high standard of upkeep and cleanliness. Accommodation: Video entry system into shared hallway with lift or stairs to second floor. The private entrance hall gives you the feeling of entering a stunning home and leads into the large superb open plan lounge/dining room (40" flat screen TV with Sky freesat, video, DVD, Wi-Fi and hi fi) and stunning artwork. Full length sliding patio doors open to the balcony and really do make the most of the view. The aspect is South and West and it is a sun trap. The lounge is beautifully furnished with stylish, relaxing furnishings and this room is open to the dining room which also boasts lake views - a perfect place for any meal. The fitted oak kitchen has slate floor and handles and is equipped with everything you could possibly need. The two spacious bedrooms have co-ordinated linens and fabrics. King-sized double, extra TV, en-suite (shower, basin and wc). Twin bedroom. The fully tiled family bathroom has bath, shower, basin and wc. Undercover parking right outside the door and as described above the gardens around the apartments are a real delight. Lastly don't forget the balcony and that view. Sorry no pets * non-smoking * duvets/beds made up for arrival - just lock up and leave * towels provided * electric oven/halogen hob * dishwasher * microwave * fridge and freezer * washer/dryer * all fuel included * electric heating * double glazing * free Wi-Fi broadband * travel cot and high chair available - please order * named parking for one car plus visitor parking. This is simply a luxurious and wonderful Lakeland hideaway with one of the very best views in the Lake District. The spectacular panoramic lake and fell views have to be seen to be fully appreciated from this penthouse apartment. £40 extra per week for all heating, electricity and laundry service. Children welcome from any age. Romney Grange offers weekly bookings starting on Saturday.